On the 16 September 2009, the Shanghai office of RSC was established in Shanghai Institute of Organic Chemistry (SIOC), the Chinese Academy of Sciences. A small ceremony was hold for celebrating, which means another world-famous academic organization has built cooperation relationship with SIOC, and will advance the chemical sciences together by collaboration. In the ceremony, the director of SIOC Ding Kuiling said, welcome RSC to Shanghai, and wish Shanghai office of RSC can be a bridge between SIOC and RSC. 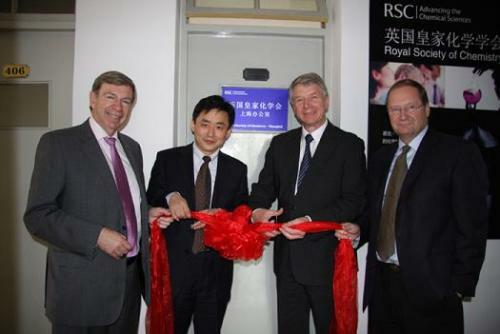 The CEO of RSC doctor Richard Pike expressed his gratitude to SIOC for RSC, and said RSC was looking forward to being the platform for exhibiting scientific research achievement and talents of China to the whole world. Royal Society of Chemistry (RSC) is not only the world’s largest organization for chemical scientists in Europe with long history since 1841, but also one of the world’s leading scientific publishers, offering an exceptional range of peer-reviewed journals, magazines, books, databases and publishing services to chemical science community, including ChemComm, Chemical Society Review and other almost 30 kinds of international journals. She is also a specialized certification organization. As a non-profit academic organization, all of incomes have been used for advancing the chemical sciences. For many years, RSC has participated in lots of international affairs about chemical sciences. The secretariat of European Association of Chemical and Molecular Sciences (EuCheMS) has been established in RSC.